The following is a guest post about taxable portions of your annuity. If interested in submitting a guest post, please read my guest post policy and then contact me. Assuming you have a non-disability annuity that started after July 1986, then there are two parts to your annuity of which you should be aware: The part that’s taxable, and the part that is known as a “tax-free recovery” for your retirement fund contributions. While different rules apply to people who retired under a disability provision, your retirement contributions should appear on your 1099R form that the IRS sends you every year for filing your taxes. Given this, here are three major things you should keep in mind when it comes to trying to understand the difference between the taxable and non-taxable portions of your annuity. Most people who started getting annuity pay-outs after November 1996 will use what is known as the “simplified method” for determining the tax-free portion of their annuity. Generally speaking, these are the three types of qualified retirement plans: employee plans, employee annuities, and tax-sheltered plans. For these plans, all you have to do is fill out the simplified method worksheet to determine your annuities’ taxable and tax-free segments. For qualified annuities, it’s important to note that these financial products are taxed in the same way as other qualified products like IRAs, 401(k)s, profit-sharing plans, and any other retirement account that carries a tax differed status. These are distinct from non-qualified annuities, though, which have a different taxation scheme from the aforementioned types of investment. To this end, non-qualified annuities are something of a unique animal. For starters, these financial products grow without being burdened by taxes until you make a withdrawal or annuitize the policy. There are also different rules governing spousal and non-spousal beneficiaries and what happens when the annuity holder dies. Non-qualified annuities, on the other hand, have earnings withdrawals that are taxable fully at the regular income tax rates. For any annuity purchased after August 1982, the earnings are taxable because they’re counted as being withdrawn beforehand. Until the account’s value reaches the amount that was invested to begin with, all withdrawals are completely taxable at regular income rates. Additionally, if you’re younger than 60 at the time of making the withdrawals, there might be a penalty assessed on any earnings that are eligible for tax. Taxes generally apply if the death benefit is chosen, and they’re levied at normal tax rates for income for any gain from the death benefit (as opposed to whatever was initially invested). Estate taxes and taxable estate provisions can also come into play here, so it might be prudent to consult FI’s Annuity Assist if you have any questions about how this works. For non-spousal beneficiaries, there are some more considerations. By paying to these beneficiaries at your death, the recipients won’t have to prove probate. There’s also no so-called “death tax” or “estate tax” to speak of; taxes are just levied as though it were normal income at the tax rates that usually apply. Any difference between the account value and the death benefit will also count as normal income for tax purposes. 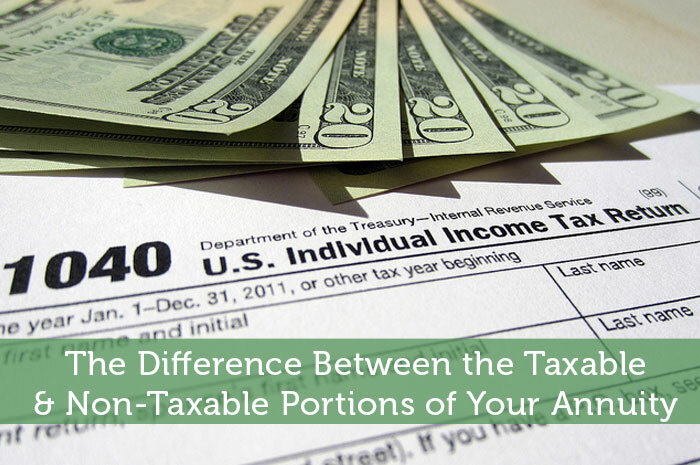 So these are the differences between the non-taxable and taxable portions of an annuity. Although your annuity policy probably reads like pure jargon in some places, it’s still incredibly useful to know the difference when it comes to how these parts of your plan are subject to tax. It’s important for numerous reasons, if for nothing else than knowing how your heirs could potentially be taxed after receiving the benefits from these plans. Author Bio: Writer Molly is a prolific writer who spends all her time on the Internet writing about everything that fancies her. She is a well sought after guest writer who can write across all niches including, but not limited to, tech, gadgets, travel, finance, education, health, etc. You can find her on Twitter as @WriterMollyP. While I am not a fan of annuities, some great information here for those that may own one. Yes they may not be for everyone, but people do have to be educated whether they own one or are considering purchasing annuities. I am not a fan of annuities as well, I just feel like there is a ton of risks and don’t like any retirement vehicles that offer guarantees because it never ends up working out that way. I wouldn’t say they never work out that way. You do have to know what you’re getting into though. Sometimes a loose guarantee is better than taking other risks. This is an interesting piece of information because annuities are time-dependent. Different years may have different rates of taxation which can be confusing. Good point. Taxes in general can be confusing, especially when retirement and investments are involved.